Vancouver, B.C. (February 7th, 2018) – The Canadian Association of Professional Sommeliers named Blue Water Cafe + Raw Bar’s Ian Wharton the 2018 Aspiring Sommelier at the organization’s annual competition. As the first recipient of this newly minted award, Ian’s superlative wine knowledge and service acumen earned him his coveted title amongst a talented group of six up-and-coming sommeliers. In a recent cover story in Vancouver Magazine’s January/February issue, Ian is described as one of the city’s new guard of sommeliers and the ‘wine architect’ due to his earlier studies at Carleton University before being smitten by the world of wine. This ambition is truly a case of passion conquering all. 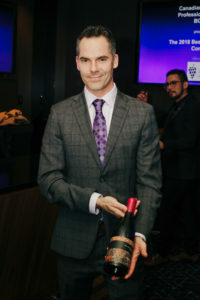 Ian’s title of Aspiring Sommelier exemplifies Toptable Group’s front-of-house talent pool and continues the legacy of the true art of hospitality with CinCin Ristorante + Bar’s Wine Director Shane Taylor winning Best BC Sommelier in 2017, Araxi Restaurant + Oyster Bar’s Wine Director Samantha Rahn in 2013, and West Restaurant + Bar’s Wine Director Owen Knowlton in 2011.